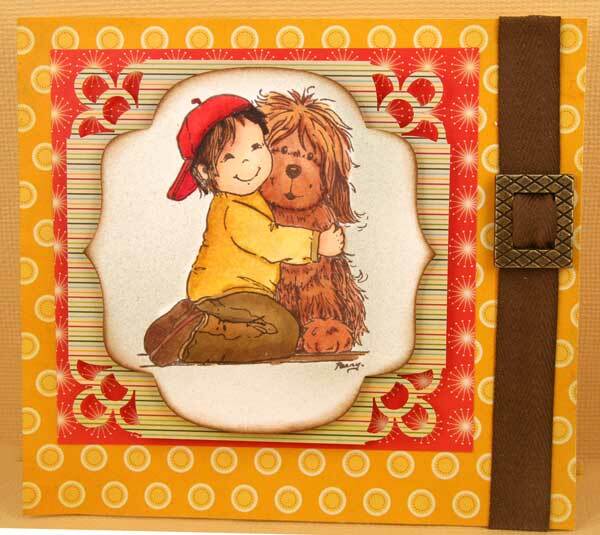 The Bobby and Me Stamp by Penny Johnson was used to make this card. Isn't it the cutest thing? I colored the image with my Copic markers and then I used an old piece of towel, saturated it with Blender fluid to give both the shirt and pants some texture. Paper from the Cosmo Cricket Garden Variety Pack 6x6 paper was used since it matched the color of the Copic Markers so well. Inking the edges of the Nestie Label 9 seemed to make the image stand out. Before I started, I very lightly air brushed the background too take away from the stark white cardstock. It was hard to make this boy card, because bows, flowers and pearls just don't suit this little guy. Therefore, I used Twill ribbon with a buckle. I think it came together rather nicely. A very sweet card Joan, totally adorable! Is this for one of your great-grandsons? He'll love it! Totally adorable card Joan. Is this for one of your great-grandsons? He'll love it! Very nicely colored with the Copics. Fabulous card, Joan! That image is so sweet, and your Copic coloring is awesome! Great job with shading and using that "splotching" technique! It is absolutely perfect! I have 2 boys and find myself feeling the same way, rhinestones and pearls just do not cut it but some scrapbook and card layouts need a lil' something and the buckle is just right. Nice job I love it! Adorable "boy" card Joan!! I think it's PERFECT!! Joan this is adorable. I really like the colors you used and the embellishment is so perfect. I love this stamp.